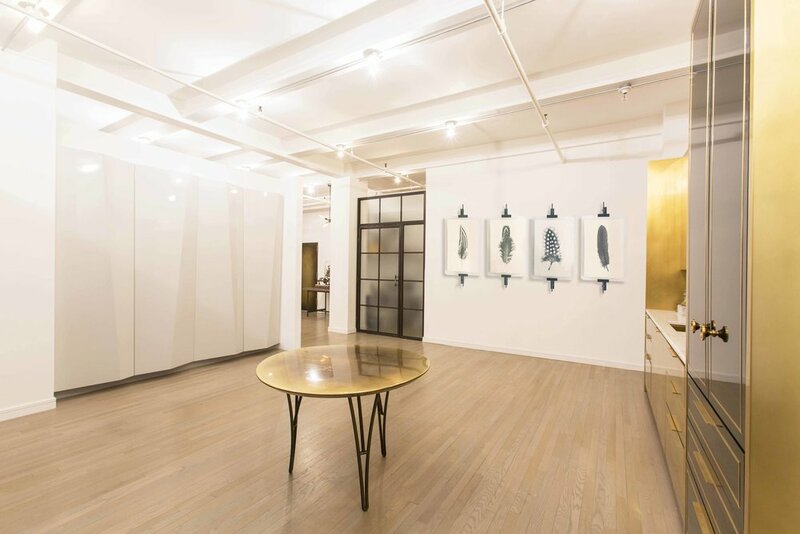 We recently renovated our New York Showroom and office to feature our entire line of customizable products. 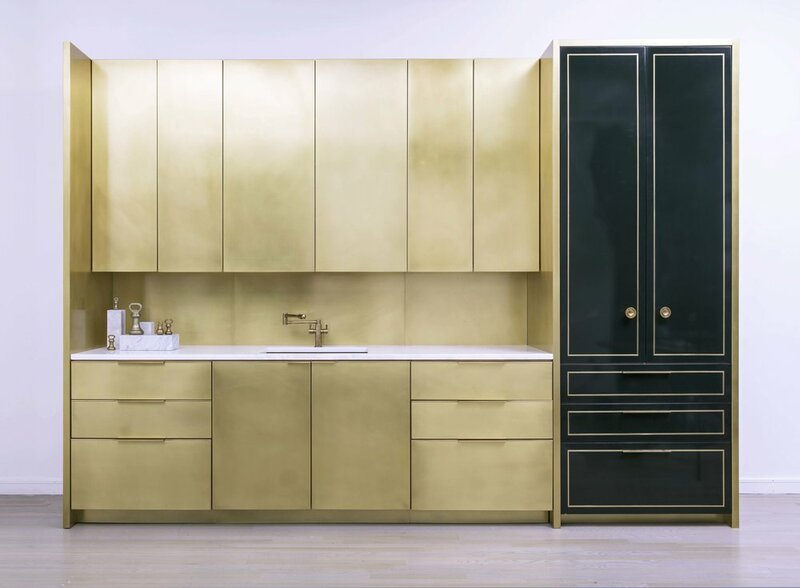 On display are variations of The Collector's Shelving System, The Loft Shelving System, The Frankford panel System, and our award-winning Brass Kitchen. Contact us today to set up an appointment. We were honored to be featured in Architectural Digest's "Where to Go Now in Philadelphia" article. Today, American Street Showroom is the setting for a photoshoot for Amuneal's new wall system. These modular systems can be set up in limitless configurations. Made of aluminum, steel, and wire glass, they are available in three different widths. The Amuneal team positions the panels. One wall in place for the photoshoot, another goes up in the background. Is it an abandoned lot of weeds or a secret garden of native species? In the end, we decided to start from scratch. The plan is to cultivate a new garden and outdoor space with lush greenery, unexpected objects, planters, furniture, and even a giant 22 foot tall (amazing) exhaust vent from our roof will be turned into a wood fired pizza oven. The nature will take some time. Until then, at least we'll have pizza. "You don't know the half of it" I'm serious, this is just the bottom half of the "pizza oven". These candles have been burning since the night of October 9th... an American Street miracle. On the night of October 9th, amid the hustle and bustle of getting the showroom set up for its first guests. (Design Philadelphia's opening night after-party) we debated about when to light all of the candles decorating the space. Too early, and they will be out before the party is over. Too late, and we are lighting them as guests arrive. Well, we needn't have worried. The candles are still lit in the steel box out side...after almost a full week!!! After this picture went out to the group, someone (beautiful) said that it means that "our house will be eternally lit and that we will have good luck." What should we do with the motorcycle that was bequeathed to us when we cleaned out 2201 American? Make it beautiful and call it art. We took the motorcycle to our shop, took it apart, polished it, and then reassembled it. Afterwards we hung it on our wall with a bracket made especially for that motorcycle. Sometimes an object is perfect just the way you find it, sometimes it needs a little "love". Good omen? Sure. This was the sky every night at sunset while we were building the showroom. Working seamlessly through the day and into the night, our evenings were marked by this amazing light streaming in through the windows. The first person to notice it would usually alert the rest of us that the show was about to begin. Sometimes a trip to the roof was called for, sometimes just a long stare out the nearest window and then (snap) back to work. This is what a showroom looks like 7 days before anyone else sees it. We were given the privilege of hosting the Design Philadelphia opening night after-party on October 9. Our collective crates arrived on October 2nd. What transpired during those seven days involved no less than 2 dozen individuals unpacking, assembling, wiring, moving, cleaning, styling, styling, and more styling, raising (an Amish-built barn structure), and dealing with the general mayhem and hard work that went into building what we now proudly call home. One of the many "family dinners" we enjoyed during setup.